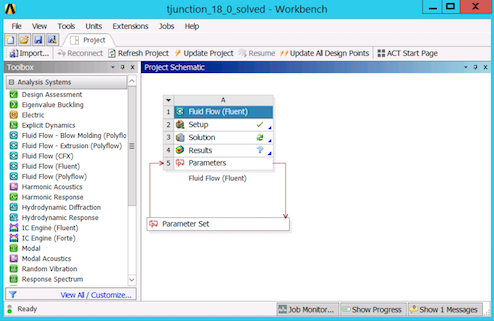 In this document, we present instructions on how to solve your ANSYS simulations in batch directly from a Workbench Archive file. 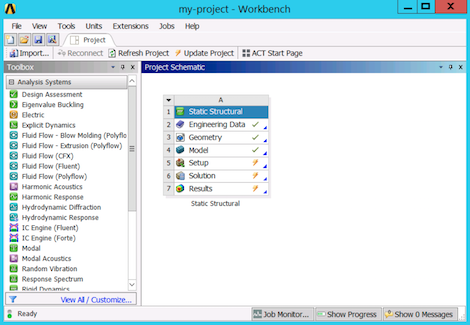 Normally, ANSYS Workbench in batch requires a number of tasks, particularly creating a journal file that must contain the right commands to solve the analysis systems (e.g. Fluent, Mechanical) from the project schematic. However, here at Rescale, we&apos;ve automated this process so that you only need the workbench archive file. As opposed to solving interactively (through the GUI), running in batch is strongly recommended for heavy workloads. By leveraging Rescale HPC resources, you can make use of your account cloud storage to store large data and result files and only use what you need for your post-processing activities. It is worth mentioning that this is not the only method to submit your ANSYS jobs in batch. Keep in mind about the standard batch submission by analysis (e.g. Mechanical in batch, Fluent in batch) if you want to piecewise update each analysis system. Refer to the ANSYS Batch Tutorials for more information. In addition, if you are new to Rescale, you can refer to our Basic Job Tutorial to read more details about submitting a batch job. Please contact us if you&apos;re having trouble. Currently, we support a wide variety of project schematics such as single systems, multiple systems, and design point analyses. 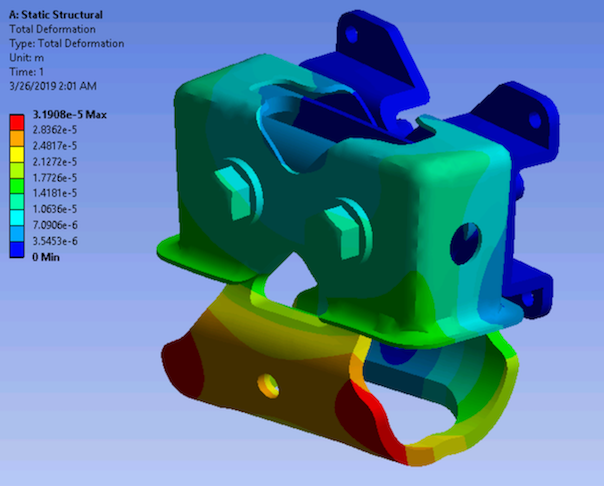 As we are working towards increasing the coverage of ANSYS Workbench project schematics (e.g. Mesh/Model component systems and FSI analysis systems among others) please read the Requirements section below to ensure your project schematic is compatible with our Rescale Workbench in batch solution. The only cells that should require an update are the Setup, Solution, & Results components of every system therein. 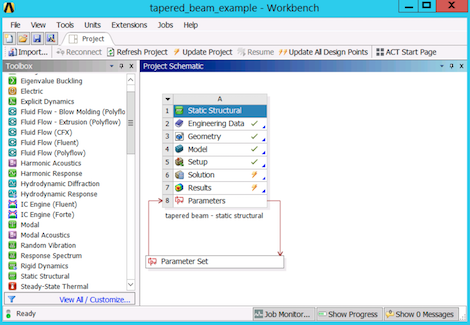 All cells upstream such as Engineering Data, Geometry, and Model should all be completed before archiving the project to solve in batch. In your Rescale platform account by clicking on + New Job; in the Input Files page, upload the .wbpz input file that you generated; any other formats such as .wbpj will not work here. 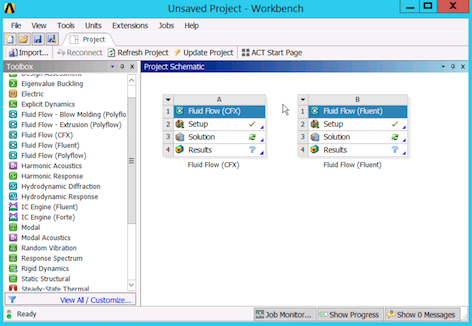 If solving a workbench project with one ANSYS Mechanical system or more, your license should contain the ANSYS Mechanical Enterprise (meba) feature which is the standalone solver option to support multiple Mechanical Batch license checkouts. 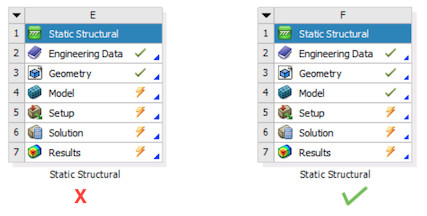 The next section covers the currently supported project schematics and their respective command that you would need to specity in the Software Settings page. --input : specify input Workbench archive (*.wbpz) to be solved. --single-frame : workbench archive contains a single frame schematic to be solved. --multi-frame : workbench archive contains a multi-frame schematic to be solved. --parameter-sweep: workbench archive contains a single frame parameter sweep to be solved. --cores-per-design-point : specify number of cores each design point is solved with. --use-license-feature : use license feature specified. --configure-arc-only : configure ARC on the provisioned cluster and exit. --archive : archive project when completed. Completed project archive will be named _completed.wbpz. --help : print this message and exit. From the list below, choose the command that corresponds to how you laid out your project schematic. 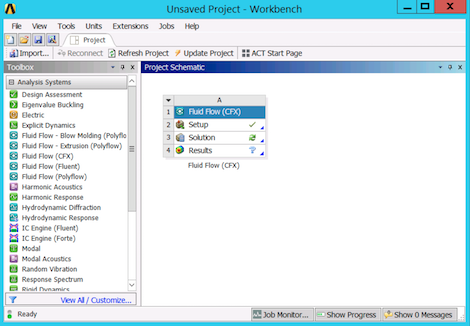 The command below solves any single system workbench project that&apos;s an ANSYS Mechanical analysis. 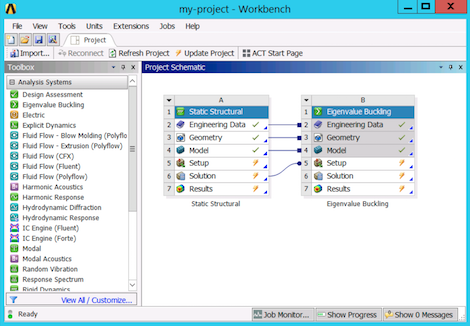 The command below solves any multi-system workbench project where all the analyses are ANSYS Mechanical; this includes dependent systems such as the one shown below as well as multiple indepedent ANSYS Mechanical systems. The command below solves any Non-Mechanical single system such as Fluent, CFX, and Icepak. The command below solves any multiple Non-Mechanical systems such as Fluent, CFX, and Icepak. The command below solves 4 cores per design point. For instance if your project contains 8 design points and you choose a 16 core Nickel hardware setting, then 4 design points (each with 4 cores) will solve simultaneously while the remaining 4 design points will wait and start as each design point completes.